Constructivism is a theory of learning which claims that students construct knowledge rather than merely receive and store knowledge transmitted by the teacher. 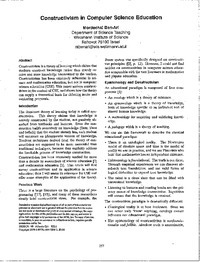 Constructivism has been extremely influential ‘in science and mathematics education, but not in computer science education (CSE). This paper surveys constructivism in the context of CSE, and shows how the theory can supply a theoretical basis for debating issues and evaluating proposals.